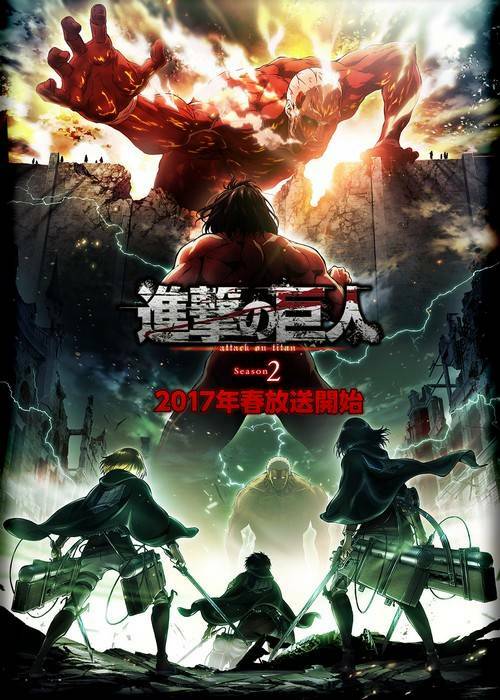 When Attack on Titan – AoT (or Shingeki no Kyojin – SNK) first released in 2013, it was a huge phenomenon among international anime community. People absolutely went crazy with this series and they were “thirst” for the second season, especially with the season 1’s cliffhanging ending. 4 years later, Attack on Titan Season 2 has finally come this year… with another cliffhanging ending. It got tons of positive reviews, but somehow, many viewers didn’t consider SNK Season 2 that highly. 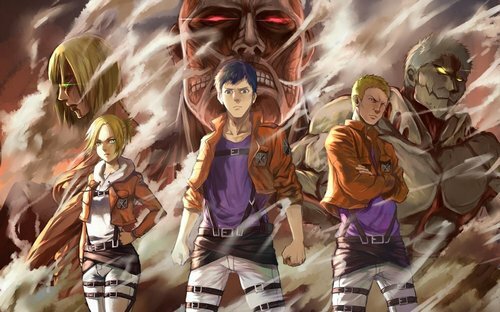 Nonetheless, Attack on Titan Season 3 has already been announced for 2018 and fans are “desperately” waiting for it. But while waiting for this next SNK season, why not take a look back at our “controversial” Attack on Titan Season 2? So here we are: How Good Is Attack on Titan Season 2? – A Round-Up AoT Season 2 Review! 2. How Good Is Attack on Titan Season 2? Personally we love Attack on Titan manga series. It is the original version and still on-going to this day with lots of interesting twists and turns. But of course, not all of us are into manga so let’s have a quick recap about this gigantic manga/anime series. 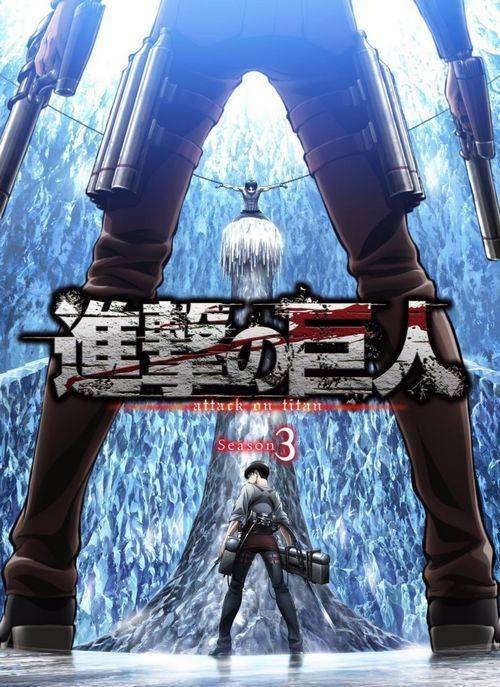 Attack on Titan (or 進撃の巨人 – Shingeki no Kyojin in Japanese) is a manga series started by Hajime Isayama in 2009. Unlike many other famous series like Naruto or Dragon Ball, Attack on Titan is a monthly series and therefore, to this point it still only has 98 chapters. The manga was positively received, yet its popularity has only boomed when the first Attack on Titan season released in 2013. In 2017 just recently, Attack on Titan Season 2 has ended and the next Attack on Titan Season 3 is going to be on air in 2018. 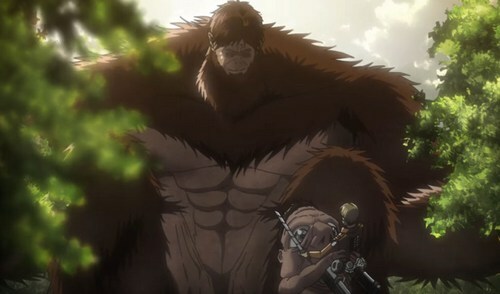 To sum up, Shingeki no Kyojin is about a world where a certain being called Titan exists. These Titans are giants which look extremely similar to human; however, these giants don’t possess intelligence like human. Their activity is more like animal, but the big problem is: they only eat mankind. No one knows about these Titans’ origins. They are only suspected to exist long time ago and the human ancestors had to struggle to survive. Eventually, the ancestors decided to isolate themselves within the enormous walls to protect themselves from the man-eating Titans. Generations later, mankind still lives behind the wall and believe in it, until one day a Colossal Titan destroy the wall. The Titans once again spreads terror to mankind. In this terror day, 3 children: Eren, Mikasa, and Armin were survived, with Eren swearing that he will avenge for mankind. But of course, killing won’t be the only thing they have to do as they will discover more secrets about the world surround them. Probably the two biggest reasons why Attack on Titan manga so well received are its horror – merciless vibe, and the story’s mysteries and plot twists. For those who are so used to other shonen series like Dragon Ball or Naruto, probably you won’t like Attack on Titan firsthand (and no, it’s not really due to “ugly art”). AoT is sort of a dark fantasy where tragedy and deaths happen all over the place. You will find tons of merciless death in this series, even the important characters. It truly gives out a sense that even main protagonist is not protected by the “plot armor”. And of course more importantly, we have tons of mysteries and plot twists about the world of AoT. The prime example is the origin of Titans. No one knows how they exist and it gives out a sense of fear, feat of the unknown (which often works splendid in dark fantasy/horror story). And as we follow the story, we gradually encounter more important questions: What is the government behind the walls? 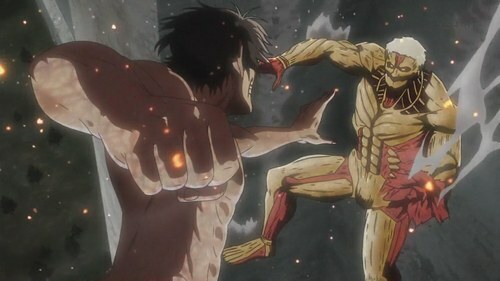 Where did the special Titans like Colossal Titan or Armored Titan come from? All of these twists and turns make Attack on Titan unpredictable. And combining with the sweet “death and gore”, AoT truly has an unique charm which makes we want to follow. With such successful manga series, what we concern left is how good is the anime, specifically Attack on Titan Season 2? Once again, Wit Studio is the studio behind Attack on Titan Season 2 and their art quality is still as good as ever. The animation also maintains fairly good quality with all the movements and actions (well, cutting Titans is supposedly not a hassle job, isn’t it?). However, there is a big complain about the use CGI here. Yes, it may be true that the team of Wit Studio is trying new technology for the series. But even so, we can’t deny that CGI is quite bad here, especially the Colossal Titan in episode 5 or 6. “Fortunately”, if you are not bothered by the CGI then this won’t be much of a problem. The music and voice acting also maintain their quality. The music gives the series quite a fascinating sensation like the opening Shinzou wo Sasageyo and the ending Yuugure no Tori. Voice acting also does a great job in making characters believable, especially the final episode “Scream”. Overall, the visual and sound are solid and great to enjoy here. Though there are certain CGI annoyances, they won’t really take away your enjoyment. However, keeping close to the original manga is also a big weakness for this season 2. People who have read the manga, just like us, may not have much trouble with AoT Season 2’s story. But it will be quite a problem for viewers haven’t read the original manga. To capture all the plots in the manga (and there are a lot), the anime has to struggle quite hard to maintain those plots. Unfortunately for the anime, almost all “plot holes” and “questions” in manga are there for a reason. Therefore, the anime story looks quite messy, especially when viewers are being “shoved” in with bunch of surprises. In addition, the anime seems to have hard time keeping the mysterious vibe of the manga. Since the manga has its own way of pacing, readers still find it interesting to follow after many years. On the other hand, the anime seems to be heavily criticized for the plot holes and unanswered questions. In truth, all of these questions and so-called “plot holes” are only answers in much, much later events. Again, unless you already read the manga, viewers who only watch Attack on Titan anime may consider the story to be messy or meaningless. Characters are relatively strong point here. 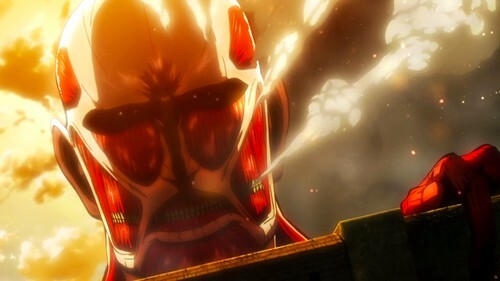 In the first Attack on Titan season, the story focused more on the struggle between Titans and humanity. Characters are well introduced but viewers may get diverse quickly due to immense amount of killings and deaths. In this second season, the story changes its attention to certain characters. It starts to reveal more characteristics and developments which are a welcoming change after watching bunches of gore-fest. That said; many viewers expressed that characters in Attack on Titan Season 2 don’t make good appearances at all. For example, the trio Eren, Misaka, and Armin does not show any particular development: Eren always shouts out loud and seems angry for no reason. Misaka is like a god-like character which is charming but that also hinders her development. 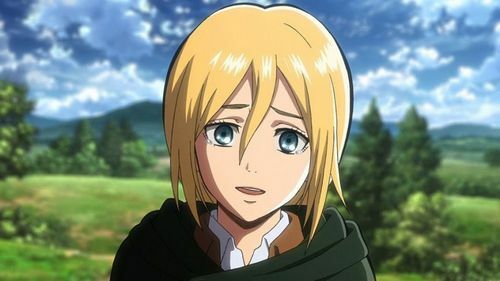 Armin is an interesting character, yet he still seems dull. In our case, the trio also doesn’t seem as interesting as they are supposed to in manga. But luckily, we are quite satisfied with their appearance in the final episode since it does bring up the relationship between Eren and Mikasa. To round up, Attack on Titan Season 2 is a good anime to watch. Even if you already know the story from manga, you can still feel the tension when characters come to life in anime. The anime decided to follow the original story from manga, which is a good thing. Characters are strong point here since viewers can take a break from immense actions and understand their favorite characters better. Yet the big problem lies within the story itself. The story in anime may feel messy, even pointless since no questions or “plot holes” are properly answered. Certain character developments are also suffered from this like the trio Eren, Misaka, and Armin. There is also a minor weak point which is the CGI, but it won’t much of a problem since there are only few CGI scenes. Nonetheless, Attack on Titan Season 2 is still an enjoyable show, especially with the sweet plot twists which anime viewers haven’t known about. Then we have a cliffhanging ending, but that’s why we will have Attack on Titan Season 3 and it is definitely worthy to wait for. Staying true to the original storyline from manga. Unexpected plot twists and surprises. Characters and character development are focused. The story can be messy and feel pointless. Certain characters like Eren, Mikasa, and Armin are not really interesting. So what do you think about Attack on Titan Season 2? How does it fare for you? Feel free to share with us and for now, thank you and stay tune for more news in the future! Summer is here! Top 10 Most Anticipated Anime Summer 2018!